All EVO 9 turbos will now come standard with a new cast stainless turbine housing. This turbine housing has been designed to maximize flow while not sacrificing spool characteristics. It has a 3" outlet and has a TiAL MV-S waste gate flange machined directly onto the housing. With the re-release of the EVO 9 BB Turbos FP debuts the new Xona Series CHRA which are a billet SS construction featuring expanded water jacketing which fully surround the entire hot side register for improved heat blocking in the turbine section. Better materials extend the service life through improved corrosion resistance and reduced heat conduction into the bearing section of the CHRA. The rotating assembly is isolated from vibration 3 dimensionally via specially designed oil damping chambers which also serve to provide variable preload to the angular contact ceramic ball bearings ensuring that bearing preload increases with oil pressure, rpm and thrust loads a feature never before seen in ball bearing turbochargers. Correct loading of angular contact ball bearings and bearing temperature are the determining factors when it comes to the lifespan of the ball bearing. The Green with it's quick response and hard hitting power curve has long been the go to turbo for the Street crowd not wanting to sacrifice spool for a 500WHP trap speed. If you want a turbo that'll break necks but not make you wait the Green is the turbo for you. Of course to harness this performance FP had to develop their own Ball Bearing CHRA and true to their nature they kept it looking as close to what came on your car from the factory as possible. This BB CHRA allows you to push the outer limits of performance by increasing the allowable thrust loads over a normal TD05/6 journal bearing turbocharger and greatly reducing the risk of oil starvation from hard acceleration and cornering forces. 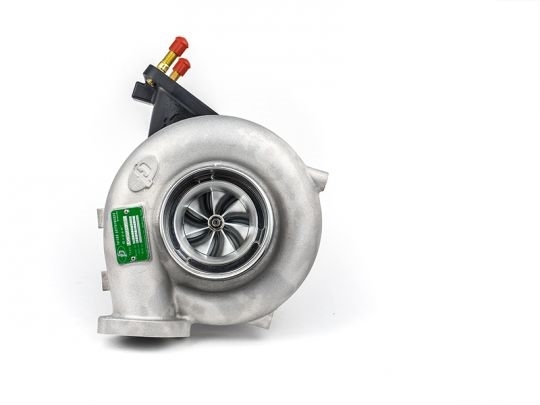 Attention: All Forced Performance turbochargers are built to order to your exact specifications and should not be considered on the shelf ready to ship unless specifically noted on the work order. Build times vary by model of turbo and options of said turbocharger we cannot guarantee a delivery date or ETA. Forced Performance is proud to announce the debut of their 100% brand new, patent pending, dual ceramic ball bearing design within the FP GREEN Turbocharger.